This autumnal salad consists of steamed artichokes, hard fried shitake mushrooms, crunchy artichoke crisps and creamy truffle mayo. The artichokes are charred which adds bitter notes to their natural sweetness and the mushrooms are pickled evoking a zesty sensation. It is served warm, and the addition of artichoke crisps adds a special crunch and the creamy truffle mayo brings the whole dish together in one delicious taste explosion. This delectable warm starter is certainly not for the faint-hearted. 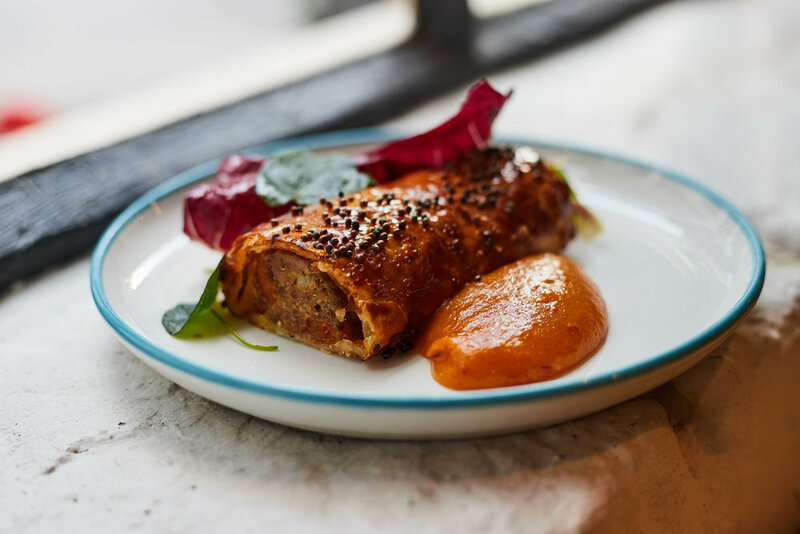 Strong earthy flavours are brought out by the mix of venison shoulder and guinea fowl legs with caramelised onion, raisin and thyme which are wrapped in fresh puff pastry. The addition of apricot jam adds extra spice and nasturtium leaves garnish the plate. The sustainably farmed sea bass is lightly poached and served on a bed of creamed leeks with pink oyster mushrooms and freshly chopped chervil & tarragon. With no skin, the sea bass is exquisitely soft and has a very clean flavour which compliments the creamy leek and mushroom fricassee – which is cut like tagliatelle creating a beautiful pasta-like consistency. The guinea fowl breast is cooked on the bone – allowing it to retain its flavour, moisture and shape. The skin is then caramelised on the planchar to roast it, creating a delightfully crispy and crunchy texture and it is served with an in-season creamy parsnip purée – something our head chef admits that he waits all year to put on the menu! The addition of both buttered and deep fried kale add an exciting texture and the umami creates a delicious complexity. This classic bread & butter pudding, made with brioche and white bread, is folded through a delightfully eggy custard and then baked. It is beautifully rich and served warm with toffee sauce on top. Raw, sliced, Granny Smith Apples garnish the pudding to bring an acidity to the dish which cuts through its creamy nature. The ultimate winter dessert, it is bound to be exceptionally popular in the upcoming chilly months. This deliciously playful dessert is an ethereal take on an Oreo. The effervescent chocolate biscuit sandwiches the rich cream cheese mousse and it is a beautiful combination of bitter, creamy and fruity flavours. The blueberry compote adds a delightfully sweet acidity and it is the perfect end to a fabulous meal.